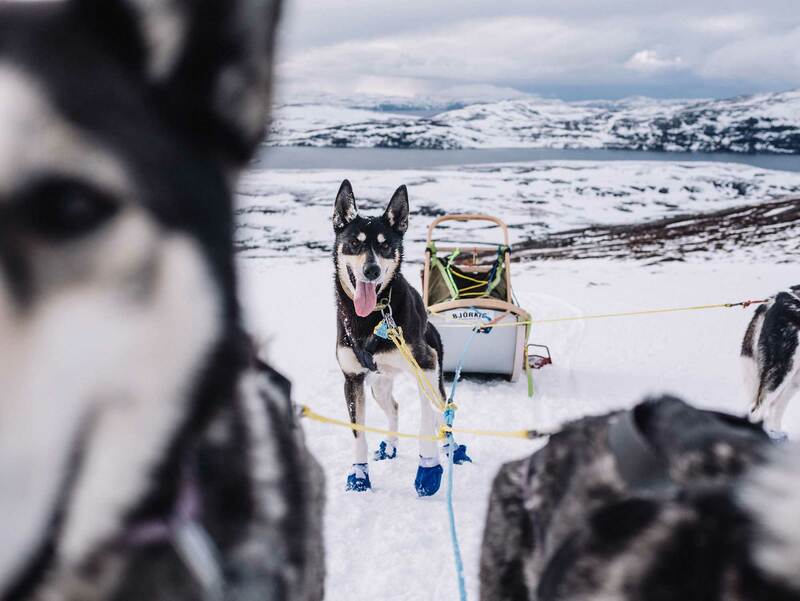 Our dogs will always be in focus when we develop products based on dog sledding. There are no compromises when working with animals. In addition to tourism, we are also an active racing kennel. The guests who visit us will always meet dogs that are happy, satisfied and well trained. They will never be in doubt that the welfare of the dogs is our top priority. We wish to share our respect, humility and love of the dogs and the nature-based experiences with everyone who visits us. After a while we return to the kennel. The dogs need to be returned to their respective kennels, and you help with this. Then it’s time to relax around an open fire with a hot drink and home baking to eat. Your guides on this trip have trained the dogs all autumn and winter and also competed in some sled dog races, from shorter races right up to the world’s longest sled dog race. We will be happy to share stories about the race, as well as how we train, feed and look after all our friends in the kennel. 15th Dec – 15th April. Included: Transfer to/from downtown Alta, warm clothing, shoes, coffee/ tea and homemade cake. warm clothing / shoes, homemade lunch. Keen to take the whole family on a dog sledding adventure? That’s no problem! We run dog sledding trips to Alta’s best tobogganing hill. It’s fun for young and old alike! We serve a homemade lunch around an open fire. We offer trips every day at 11 am. 15.12 – 15.04. At 11am. Included: Transfer to/from downtown Alta, warm clothing, lunch, hot beverage. Dog sledding; traveling in a winter wonderland on a sled pulled by happy huskies. It is dark and silent, but the white snow and your head torch makes sure you see what you need. The Northern Light: Sparkling and dancing across the arctic sky. Maybe these two experience is highly rated on you list on what to do while you`re in Finnmark? Why not try them both in the same evening? Experience the best on offer in Alta with this unique combination tour! 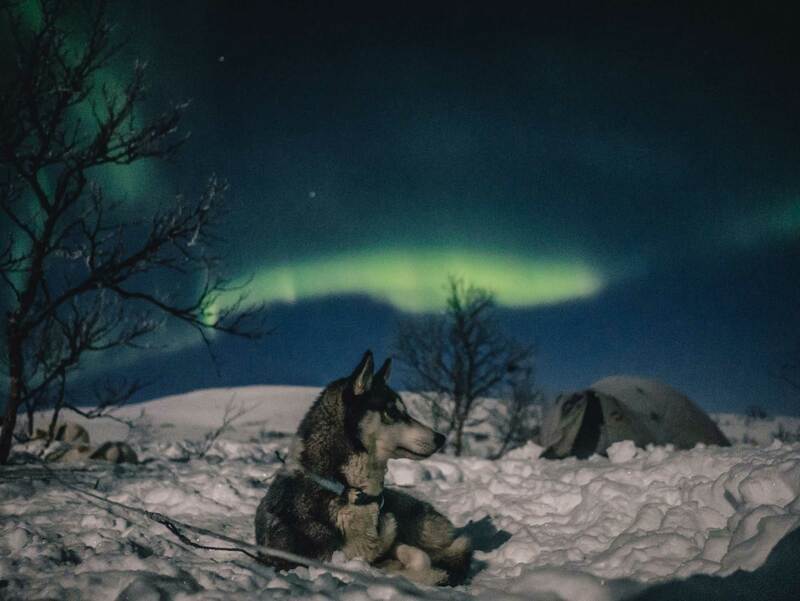 Dog sledding with us at Trasti & Trine with Alta’s leading Northern Lights hunters at GLØD Explorer. As our guest, you will be picked up at 4.30 pm at one of our winter pick-up points in downtown Alta and driven out to Trasti & Trine. On arrival, you will receive warm clothes and winter boots and an introduction to mushing (driving your own dog team). After setting up your own dog team, you will head off on a fast and exciting adventure through the snow-covered pine forest, with the Alta River as the nearest neighbour. This is an extremely peaceful experience, the silence only disturbed by the sound of many paws in the snow and of energetic dogs panting. After this you are ready for your next adventure: Hunting for the Northern Lights. You will be transported from the kennel and down to Gløds basecamp. After a brief presentation of this mystical phenomenon, we use the weather forecast and local knowledge as background information to determine the best place to head on this particular evening. Sometimes we have a short drive, other times it can be longer. The experienced guides from GLØD don’t give up even if it’s overcast in Alta. Not a chance! They will happily drive 100 km each way, if that takes you to the place with the best chances of experiencing this fantastic phenomenon! As this is a natural phenomenon, there are no guarantees of seeing the Northern Lights, but last season we found the Northern Lights on no less than 90 % of our tours! You will generally be back at your hotel by 11 pm. Price: NOK 3025 per person. Do you feel this is something you want to experience or perhaps you have experienced dog sledding before and are now ready for a longer trip.ﾠ Some people will find this trip more like a short expedition. It can be challenging to be on a trek of several days’ duration, during which most of the time is spent on a dog sled in all types of weather, from sunny and calm conditions through to wind, a snowstorm and freezing cold conditions. April is a month with lots of sun and stable weather. The days become increasingly longer and it never gets dark. We stay overnight in mountain lodges, where we eat dinner and breakfast. We enjoy lunches outside around an open fire. Preparations are made so that as a participant you will participate in the care of the dogs and feeding them in the morning and evening. The trip starts and ends at the kennel at Trasti & Trine if snow conditions permit. All participants drive their “own dog team” with 4 – 6 dogs in front of the sled. There is space in the sled for your bag containing your personal gear and also for some common gear. Please refer to the tour programme, equipment list and our guarantee. The tour price excludes: flights, pre and post tour accommodation and meals, and any alcoholic beverages. Specific dietary requirements, e.g. vegetarian meals, is not available on our wilderness trips, please contact us. We can arrange pre and post tour accommodation in unique conditions close to the dog yard. 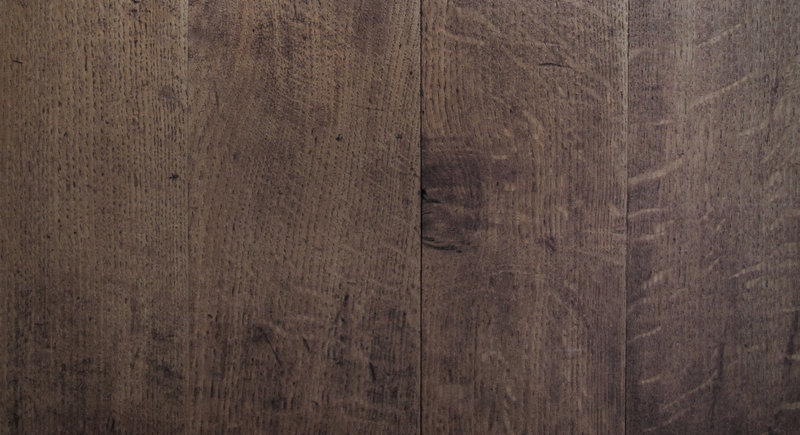 Please contact us for further information and a quote. The tour price includes: Hire of warm thermal suit, winter boots and mittens, accommodation, meals, sled, dogs and guide, as outlined in the tour programme. Specific dietary requirements, e.g. vegetarian meals, is not available on our wilderness trips, please contact us. Are you looking for a new challenge? Do you feel this is something you want to experience or perhaps you have experienced dog sledding before and are now ready for a longer trip. Some people will find this trip more like a short expedition. 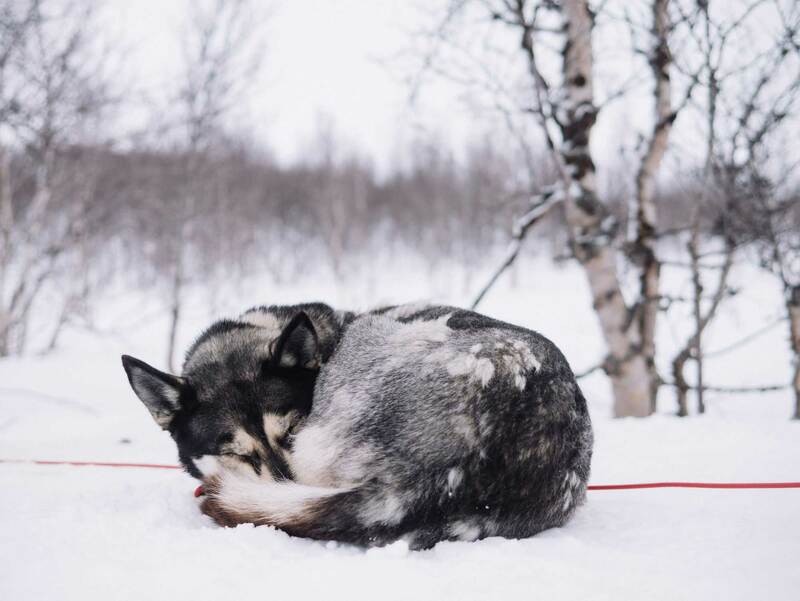 It can be challenging to be on a trek of several days’ duration, during which most of the time is spent on a dog sled in all types of weather, from sunny and calm conditions through to wind, a snowstorm and freezing cold conditions. April is a month with lots of sun and stable weather. The days become increasingly longer and it never gets dark. We stay overnight in mountain lodges, where we eat dinner and breakfast. We enjoy lunches outside around an open fire. Preparations are made so that as a participant you will participate in the care of the dogs and feeding them in the morning and evening. The trip starts and ends at the kennel at Trasti & Trine, if snow conditions permit. 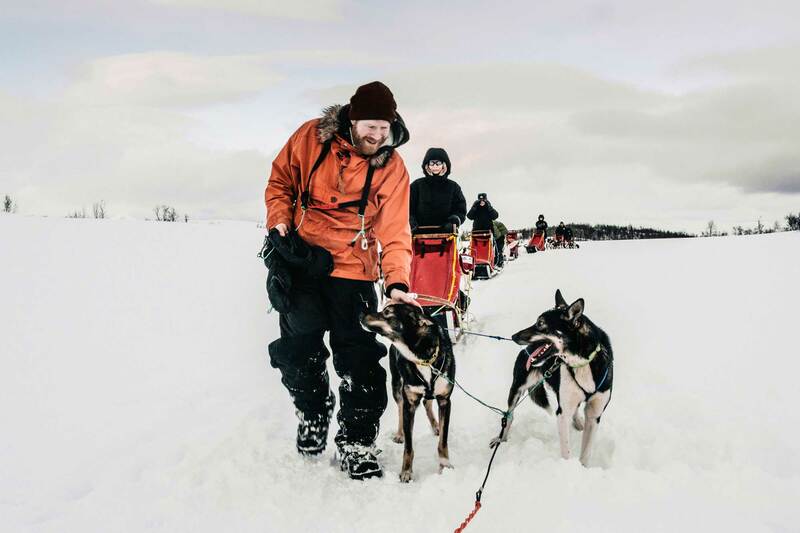 All participants drive their “own dog team” with 4 – 6 dogs in front of the sled. There is space in the sled for your bag containing your personal gear and also for some common gear. The sun has just returned after a two-month absence. The light at this time of the year is something that has to be seen to be believed – the blue Arctic light is truly unique. The “blue hour” last a long time and we also have the chance to catch a glimpse of the winter sun. In the evening, there is a high probability of experiencing the magical Northern Lights in the night sky. All of this is in addition to the dog sledding trip, looking after your ”own” dog team, staying at Jotka Fjellstue (mountain lodge) and delicious food. Imagine you have only lived in this world for a few weeks or months. Everything is new and exciting. There are new smells, new challenges and new experiences everywhere you go. Imagine also that you have many siblings who are equally curious and energetic. 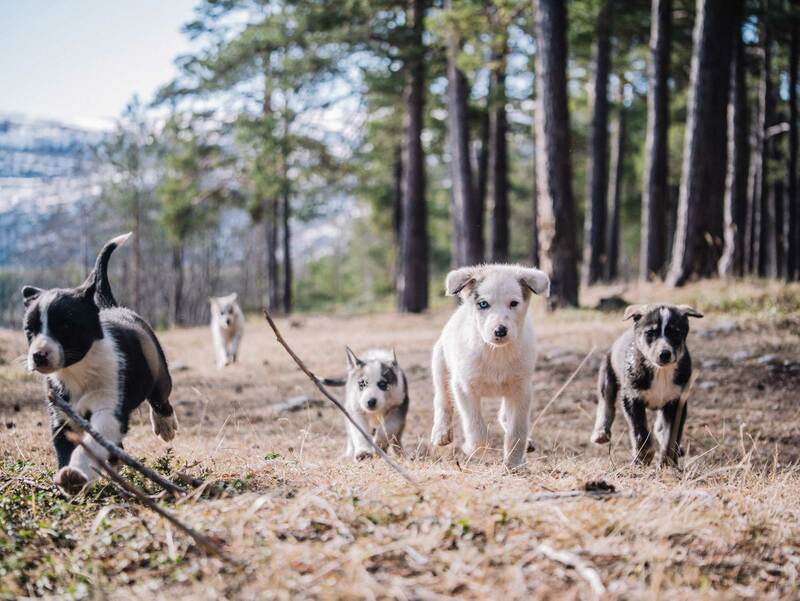 Join us for a walk and experience first-hand the enthusiasm and the joy of life of the husky puppies. We start with the brief tour of the dog enclosure and you will also have a chance to meet and greet the adult dogs. We walk through pleasant pine forest down to the Alta River. We adapt the length and tempo to suit the participants. Choosing a route that enables you to bring a pushchair is also an option. We stop along the way and light a fire and relax with a cup of tea/coffee and a slice of homemade cake. Your guide will explain about the life that awaits the puppies and stories about what it’s like train, work with and compete with huskies. / tea and homemade cake. You have never felt as close to nature as when you are camping overnight out in the open. Food has never tasted as good as it does when you are sitting round an open fire after a long day of hiking. The golden rays of the Midnight Sun or raindrops falling on the tent, contented dogs curled up in the heather, fish jumping in small mountain lakes. Want to join us? We start by looking at the map and planning the trip together. We can adapt the trip to meet your needs and wishes. The tents and group equipment will already be packed. All adult participants must be prepared to carry a backpack containing their own personal belongings and some of the group equipment. When we are ready, we enter the dog enclosure so you can meet and greet around 50 happy Alaskan huskies. We choose the dog or dogs that will join us on this trip. 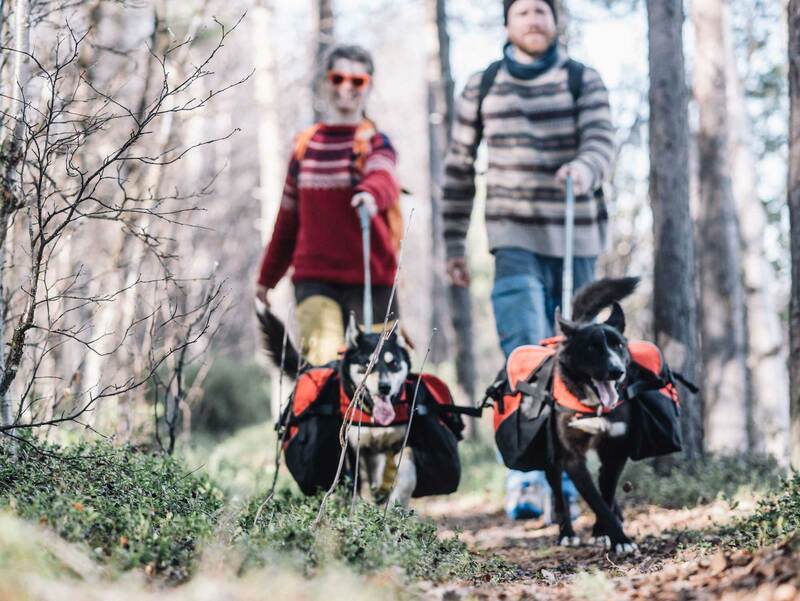 With a little guidance, you can harness and attach the pack to your dog. We are then ready to set off. We start our hike in gentle woodland before beginning the ascent in to the mountains. There are a few steep sections, but we allow plenty of time to enjoy the view that gradually emerges. The last few kilometres are in gentler terrain up in the mountains surrounded by mountain birch and several smaller lakes. When we reach the camp site, we pitch the tents, care for the dogs and prepare dinner. You have the choice of sleeping in a tent or out in the open. After a good breakfast, it’s time to pack up camp. We have the option of returning directly to the dog enclosure or adding to the adventure. We can climb a mountain, see if the fish are biting or extend the hike slightly. We reach a joint decision, but the adventure ends back down at the dog enclosure no later than 4pm. Price: 3500 NOK . Min. 2, max. 6 participants. Season: Daily from 15 June – 1 October. Included: We provide a tent, all necessary food, maps, huskies, packs and (if necessary) sleeping bag, ground pad and backpack. We are so fortunate to have a fantastic landscape right outside our dog enclosure – and it’s just as wonderful all year round. The smell of the warm forest floor and tempting pure river water on a fine summer’s day. Lighting a fire to brew hot coffee on a cold, grey day. Crackling autumn colours, the crisp air and bright red lingonberries covering the heather. Join us for a memorable trip! This adventure starts inside the dog enclosure where you get to meet and greet around 50 happy Alaskan huskies. We choose the dog or dogs that will join us on this trip. With a little guidance, you can harness the dog and attach the pack. Everything we need for the trip will already be packed. You are involved in deciding where we are hiking to. We can hike up the nearby mountain, Pæskanasen, and enjoy the view of the valley and river from the top or another option is to stay in the forest and follow the Eibyelva river for a while. We’re not in any hurry and make several stops along the way to share stories. The dogs can pull you up the steepest parts if you would like a little help.. We stop to enjoy a homemade cake and coffee along the way before concluding the trip back down at the dog enclosure. Season: 1st of june to 1st of october. Finnmark is the realm of contrasts. The landscape that just six months ago was filled with short, dark days is now bathed in summer light. On evenings like this, it’s hard to go to bed. Both body and soul prefer to be outdoors. Join us one such evening to walk to the top of a local mountain. This adventure starts in the dog enclosure where you get to meet and greet around 40 happy Alaskan huskies. We choose the dog or dogs that will join us on this trip. With a little guidance, you can harness the dog and attach the pack. We are then ready to set off. We hike to the top of Pæskanasen, a small summit about a 90-minute walk from the dog enclosure. Some sections are quite steep, but we allow plenty of time and have several stops along the way. Our four-legged hiking companions can pull you up the steepest parts if you would like a little help. Your guide for the evening will tell you about Finnmark, the local area and what it’s like to train and compete with huskies. As we reach higher up, we are rewarded with wonderful views of the valley, Storelvdalen. When we reach the top, we will prepare dinner on an open fire. The food is homemade and tasty and is prepared using local produce. We enjoy both the meal and the view. The bright light and the sight of the sun that never sets make it hard to comprehend that it’s so late. The descent is relatively quick and we will return to the dog enclosure around 11pm. Included: Meet and greet the dogs, homemade dinner prepared on a bonfire.